Zooropa is the first track off the album of the same name. It was released in 1993 as a follow up to Achtung Baby. Lyrically, Zooropa achieves a new language for Bono to use - a language that's more his own, that he feels more comfortable with. Zooropa is prime insight to that language. Well, he's come a long way since Boy. The song's lyrics touch on how technology both unites as well as separates us from each other (it would be interesting to see what Bono would say about Facebook). 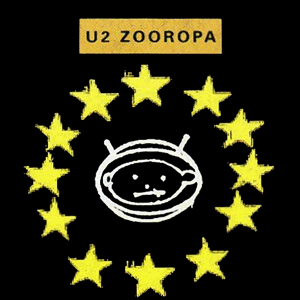 The Zooropa track, for instance, contains popular advertising slogans such as "Better by design", "Be All That You Can Be" and "Vorsprung durch Technik". Check out the lyrics to "Babyface" and The Edge heavy "Numb".